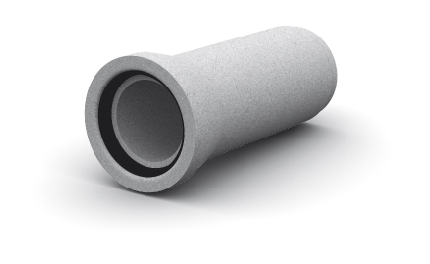 Elements of the Matbet Wibro TB system are concrete and reinforced concrete pipes with a nominal length of 2500 mm, circular cross section, without foot for use in sanitary and rain drainage systems, diameter range 300-1200 mm. The high seal tightness of the joint is guaranteed by the factory built-in gasket gasket. Production and reception are carried out in accordance with the requirements of European standard PN-EN 1916. Wibro TB pipes are manufactured using new, specialized equipment from well-known European companies such as Schlüsselbauer, BFS, MBK, which guarantee high quality products. In addition to using the system, the Wibro TB pipe can be used for the construction of road culverts.